The Jewish community was part of Lawton, Oklahoma, from its first days of white settlement. In the spring of 1901, white settlers heard rumors that the Indian reservation lands adjacent to the Fort Sill military base, established in 1869 as an Indian fighting outpost, would be opened for settlement. No one knew on what day the lands would be opened. So Moses Iralson, intent on opening a general store there, traveled to Washington, D.C. to find out. A series of meetings beginning with an appointment with his friend Lyman Gage, then Secretary of the Treasury, led Iralson to a meeting with none other than President William McKinley. “He very kindly informed me that the date was August sixth and wished me ‘Good Luck’ in my venture,” Iralson wrote.After buying goods in New York and Chicago, Iralson set up a large tent outside the reservation with his brother-in-law Morris Simpson. They began selling their merchandise three days before the reservation opened for settlement, making their first transaction with an Indian man named Oyah, to whom they sold a blanket. On August 6, 1901 the brothers-in-law carried their prefabricated frame-building onto the town site they selected, becoming the first dry goods store in Lawton. In addition to Iralson, at least two other Jewish settlers made their way to Lawton for opening day. A. Lowinger walked the 30 miles from Marlow to Lawton and waited a few days before purchasing the maximum two permitted lots: a business lot and a residential lot. Though intending to open his own business on one of them, Lowinger later wrote in a book of Lawton pioneers: “I found that it was better business for me to stay out of business,” because for many years he charged a rent of $150 per month on the business lot. During the 1901 land sale, Samuel Epstein also bought land and later opened a men’s clothing store. Louis Trope came to Lawton in 1901 as well, and by 1913 his brothers, Isaac and Morris, had come to town as well. Louis initially set up a horse and mule business, but within a few years had switched to real estate. Morris opened Trope’s Leading Clothier in 1916. Morris’s son Marvin joined the business in 1941, and Marvin remained a partner in the family store until his death in 1967. 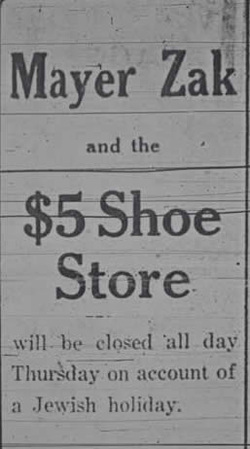 The business continued for another year until Morris’s death led to the store’s liquidation in 1968. The family maintained its ties to Lawton, and Marvin’s wife Frances was one of the three remaining Jews there, until her death in 2016. ​Despite at least seven Jewish individuals and families making their way to Lawton by 1910, the group made little effort to create a Jewish community. Only a couple of events stand out as indicative of Jewish communal life in the early years. Morris Simpson brought a Torah scroll with him to Lawton, purportedly the first Torah brought into what became Oklahoma. For many decades the Torah made its home in the chapel at Fort Sill. A 1906 wedding announcement between Louis Trope and May Goodman, sister-in-law of S. Epstein, brought Rabbi Joseph Jasin from Fort Worth to officiate at the ceremony. Since no formal Jewish communal life existed in Lawton—or in Fort Sill—for almost two full decades, the Jewish contributions to Lawton were mainly economic and civic. Many of those contributions, in turn, were the work of Morris Simpson and his wife Pauline. 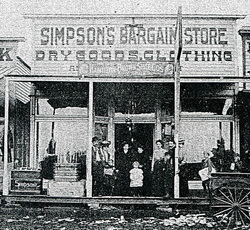 Within two years of opening his store with Moses Iralson, the Latvian-born Simpson had bought out his partner and built a brick building to house what he renamed Simpson’s Bargain Store. By 1911 it was called Lawton Mercantile Company, the name it maintained until Pauline closed the business in the early 1930s. The store quickly became known as a safe-haven. It sheltered women and children escaping a fire that blazed through Lawton in March, 1904, and a group of Comanche Indians caught outside during a cold spell one night. It provided a place for early settlers to keep their money and valuables safe. Most of all, according to former Fort Sill chaplain Melvin Glatt, it was a place for “young and homesick Fort Sill officers,” serving as an unofficial soldiers’ center long before the USO existed. 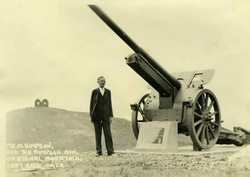 Morris Simpson stands next to the "Simpson Gun." Morris Simpson’s subsequent purchase of a farm contributed to the couple’s financial security, making their philanthropic endeavors sustainable. Simpson is often cited for making Lawton into a market for cotton, and he also had interests in the oil and cattle industries. The Simpsons’ major civic initiatives centered around education and the military. In 1904, Simpson donated 178 volumes to the newly-opened Carnegie Library in Lawton. Each year, the couple presented a silver trophy to the top honor student at Cameron State School of Agriculture (now Cameron University) and financed tuition for many other students. Simpson’s interest in and devotion to the military were instrumental in making Fort Sill the permanent home of the Field Artillery School in 1911. In the 1920s, Simpson lobbied for a memorial to Fort Sill’s fallen World War I soldiers; the result was the 1929 dedication of the Simpson Gun, captured from Germany in World War I. Its inscription reads: “This stone was emplaced at the suggestion of Morris S. Simpson, an original settler of Lawton and a staunch friend of the army.” The memorial was dedicated two years before Simpson’s death. 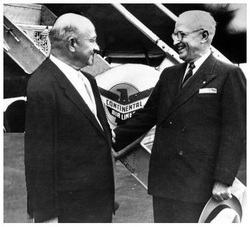 Edward Jacobson with Harry Truman, whom he met at Fort Sill. Several noteworthy Jews spent time at Fort Sill. Edward Jacobson, who had a significant influence in the creation of the State of Israel, was stationed at Fort Sill, where he met fellow soldier, Harry Truman. The two men became friends, entering into a short-lived business together following the end of World War I. They remained friends even after Truman was elected president, and Jacobson began discussing the plight of European Jews with Truman during World War II. In 1948, it was Jacobson who convinced President Truman to meet with Chaim Weitzman, who became Israel’s first president. Two months later, with President Truman’s support, the State of Israel was established. The comic filmmaker Mel Brooks also spent time at the base, as did Supreme Court Justice Ruth Bader Ginsburg, whose husband was stationed at Fort Sill. By 1918, after the U.S. had joined World War I, the number of Jews in town was on the rise. Many of the families who came during the years leading up to World War I opened stores that would grace the streets of Lawton for decades to come. 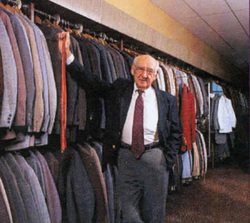 Ralph Zak came from Poland in 1912, and after three years of employment as a tailor at Fort Sill, he opened his own clothing store, a version of which remained opened after his death, run by his son-in-law, Al Granoff, until the early 1970s. Phil Hornstein came to Lawton in 1915 and opened a women’s clothing store which he operated until 1949. In 1917, Mannie Herskowitz opened The Parisian women’s clothing store in downtown Lawton. In 1941, Mannie’s son-in-law, Bill Ritzwoller, took over, and by 1965 Mannie’s son, Harold Herskowitz, owned the store, which he kept open until his retirement in 1986. The Jewish Welfare Board, established nationally after the U.S. declared war against Germany, began to look at Fort Sill in 1918. A visiting JWB official in that year recommended forming a local chapter at Fort Sill. He found 11 Jewish families in Lawton, and identified four community members as the “principal Jewish people in the town”: Morris Handwerker, Adolph Lowenger, Pauline Simpson, and Louis Trope. Still, the committee’s assessment of the Jewish community was pessimistic: “The townspeople have given no personal service to the Jewish boys of the camp… The complete lack of organization of the community and their total lack of vision beyond the making of money out of the soldiers, do not give us much hope of effective service from this community.” At the same time, the JWB noted, 65 military personnel attended dinners and services conducted at the base by two Oklahoma City men on Rosh Hashanah and Yom Kippur. The Passover seder, the report noted, was to be a combined effort between Fort Sill and Lawton, though Lawton’s financial contributions “have been insignificant”—most of the preparations were undertaken by Oklahoma City Jews, including Rabbi Joseph Blatt, and “only Mrs. Simpson is showing any real interest” in offering assistance to the seder organization. Indeed, an obituary for Pauline Simpson noted that the couple served dinners for Jewish military personnel stationed at Fort Sill. The interwar years brought at least eight new Jewish families to Lawton, who either opened their own stores or become employees at existing Jewish-owned stores. The few Jewish soldiers who stayed in Lawton after the war, like those who would stay after World War II, mostly married non-Jews and weren’t involved in the community. These new Jewish families joined a growing community. Mayer Zak came to Lawton from Poland in 1921, opening his own clothing store after five years of working in his brother Ralph’s store. Finally, after six years apart, his wife Minnie joined him in 1927, at which time he owned a shoe store. By 1930 Mayer owned The Hub Clothier, and was later joined in that venture by his daughter’s husband, Ellis Hirshman. The Hub remained opened until a few years’ after Mayer’s death in 1961. Although there was no formal Jewish organization in Lawton, the Zak brothers and their families worked to maintain their traditions. In April of 1927, Ralph’s son was born, and Rabbi Meyer Cohen of Oklahoma City’s Orthodox Emanuel Synagogue came in to perform the baby’s circumcision. Mayer Zak would run an advertisement in the local newspaper informing readers that his store would be closed for Yom Kippur. The only recorded instance of anti-Semitism in Lawton, too, relates to the Zak family. The Ku Klux Klan, to which most of the City Council belonged in the 1920s, had plotted to attack both the Zak and Trope families. However, when Jim Harrold, owner of a bus and baggage company and an influential man in town, got word of the Klan’s plans, he threatened “bear all the means and methods at his disposal to retaliate in kind,” according to Harrold’s daughter. Faced with this threat, the Klan backed down. Mostly though, the Jews in Lawton lived happily, fitting into local life without problems. Lewis Zorbis came in 1926, opening The Dixie Store, a branch of Chickasha’s Jewish-owned store by the same name. The next year his brother David joined him; their sister Jeanette joined as a partner in 1953 upon Lewis’s death, and their sister Florence also became a partner before David sold the store in 1968. Moses Stein arrived in Lawton in 1926 and within a few years owned a junk yard. By 1946 Moses Stein’s junk yard had become Stein Iron and Metal, run by Moses and his sons Sam and Victor. Sam ran Stein Iron and Metal—later renamed Lawton Recycling—until he retired in 1999. Another of Moses' sons, Ben, arrived in Lawton in 1931. He worked for an uncle, Ralph Zak, before opening Townes Men’s Store. Ben Stein and Townes Men’s Store became fixtures of Lawton. Stein often provided clothes for families who couldn’t afford them, invited Fort Sill soldiers to his home, and hosted hungry people to dine at his expense. In 1999, when Stein closed the store, he had been in business in Lawton for 54 years. Ben Leva’s auto supply store was around for over 35 years. By 1937, 38 Jews lived in Lawton. The influx of Jews during the interwar period paved the way for the development of Jewish communal life in Lawton. The arrival of large numbers of Jewish soldiers and the introduction of a Jewish chaplain to Fort Sill during World War II were the catalysts. In 1942, 300 Jewish men stationed at Fort Sill attended a picnic, with food provided by the Jewish community in Tulsa. At the time, Morris Trope’s wife Anna was the chairman of the Jewish women’s committee of the local USO, and made all the arrangements for such social events. The next year, the Jewish Welfare Board at Fort Sill, headed by Mannie Herskowitz and Julius Ratner, organized a Passover seder that drew at least 200 attendees, including a few from neighboring towns. The seder was held at the First Methodist Church, where it would be held for years to come, while services were led by Fort Sill’s Jewish Chaplain, Myron Silverman. A notice in the Southwest Jewish Chronicle from that year lists 17 Jewish families in Lawton, not including the numerous military families who had moved to Fort Sill during the war. The next two Passover seders drew around 600 soldiers each, with food prepared by Lawton women. Though the end of the war led to a decrease in the number of Jewish soldiers, the Jewish community in Lawton that had been built over the preceding years remained strong. From World War II until the Vietnam War, Shabbat services were held at Fort Sill weekly on both Friday nights and Saturday mornings, in addition to holidays. While the civilian Jewish community and Jewish military personnel participated together in religious services, the role of the Jewish chaplain was to serve Jewish soldiers not to act as a congregational rabbi. For other life cycle events, the Jewish civilians of Lawton brought rabbis and educators to their community. When Marvin and Frances Trope’s son was born in 1953, the family brought a mohel from Fort Worth to conduct the baby’s circumcision. In 1947, Jews established a Sunday school that met at the home of Ben Leva. Each Monday, Rabbi Morris Goodman traveled the 52 miles from Wichita Falls, Texas, to Lawton in order to teach four Jewish children Hebrew and Judaic subjects. Rabbi Goodman oversaw the bar mitzvah of Sidney Milun, son of Ida (Trope) Milun, at the family’s home in Lawton. Nevertheless, the Jews of Lawton and those at Fort Sill did sometimes work together. By 1953, classes had moved to the Jewish Religious Center Building at Fort Sill. The previous year, Fort Sill Rabbi Irvin Schor, Al Granoff, and Marvin Trope had sat on the Sunday school committee, and Merv Berman and Herb Pion, both stationed at Fort Sill, had been teachers. Jewish life at Fort Sill remained vibrant in the 1950s, and the Jewish civilian population from Lawton continued to benefit from the presence of a Jewish chaplain. In 1955, Rabbi Maurice Aranov led Conservative services, celebrating two days of Rosh Hashanah. The next year the Sunday school that Aranov organized for civilian and military children had 20 students enrolled. Moreover, a Jewish Center at Fort Sill was open weekly for social activities, classes, and counseling, in addition to Shabbat services. The Hillel at Oklahoma University-Norman helped organize social events and holiday observances, and the Passover seder garnered around 150 people. 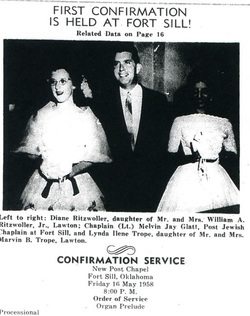 The community’s first confirmation ceremony, for Diana Ritzwoller and Lynda Trope, was conducted by Rabbi Melvin Glatt at Fort Sill in 1958. The ceremony was an interfaith affair, with a Methodist minister presenting Diana and Lynda with certificates, and another chaplain presenting them with bibles. Monthly bulletins announced Sunday bagel brunches and holiday celebrations, which made use of the kosher kitchen on the base. Though members of the Jewish community came from backgrounds with varying levels of religious observance, a report by Chaplain Frank Sundheim in 1959 noted that being respectful of each others’ observance was no problem; they “do so quite amicably. All that is required is a bit of ‘Menschlichkeit’ on the part of each individual.” Notably, though Rabbi Sundheim was ordained in the Reform movement, both the first two and last two days of Passover were observed, according to the more observant tradition. The Jewish population at Fort Sill grew during the Vietnam War, and Jewish activities took place in a six-room building designated as a Jewish center. For a few years, Rabbi Harold Kushner served as the Jewish chaplain at Fort Sill. In 1962, community members joined with the soldiers and Jewish chaplain to build an outdoor menorah to publicize the holiday of Chanukkah. In 1970, though the base still offered bagel brunches once a month and the Jewish center building was used for regular social activities, soldiers attended Passover seders with families in Dallas. After the draft was abolished in 1973, the Jewish population at Fort Sill declined. Though they never established a formal congregation, Lawton Jews were active in statewide Jewish life. Morris Trope was a member of B’nai B’rith, while Ralph Zak served as the president of the Southwest Oklahoma B’nai B’rith in 1940. Buddy Garber, who owned a jewelry store in Lawton in the 1950s, was a member of both B’nai B’rith and the Zionist Organization of America. Support for Israel was strong among Lawton’s small Jewish community. Ben Leva and Ben Stein were both cited by the ZOA for their support of the Kfar-Silver Agricultural Institute in Israel. During the post-war years, Lawton Jews continued to be active in the local business community. Harold Herskowitz, who by this time was a co-owner of The Parisian, was elected president of the downtown business association, while Ben Stein and David Zorbis were elected to its board. October 1961 brought a shopping center to Lawton, and The Dixie Store, The Parisian, and Townes Men’s Store, all moved from their downtown locations to the new shopping area. Minnette Page and her husband Homer opened Page’s Casual Shop in 1959. After the Pages closed the clothing store in 1984, Homer opened The Hem Shop, an alterations shop. Minnette Page also made important civic contributions to the town: she taught in Lawton public schools for 35 years, and served two terms each on the city council and the public school board. The Jewish population of Lawton began to dwindle in the 1980s as the community was growing older or moving away. By 1980, the only Jewish-owned stores still in business were The Casual Shop, The Parisian, Townes Men’s Store, and The Vogue; all of these stores were closed by the end of the 1990s. The drop in the number of Jewish soldiers at Fort Sill also weakened the local Jewish community, though a Jewish chaplain was still stationed at the base. In the 1990s, when the military considered removing a Jewish chaplain’s post from Fort Sill, Minette Page contacted her senator, who used his influence to keep a rabbi on the base. Thanks to Page’s efforts, Fort Sill maintained a Jewish chaplain until 2011. Today, Lawton’s Jewish population consists of just a handful of people, including a few faculty at Cameron University. Fort Sill still holds a Passover seder each year with food provided by the women of Emanuel Synagogue in Oklahoma City. While this seder is much smaller than the 600-person seders held during World War II, it is a testament to the endurance of Jewish traditions in Lawton and the centrality of Fort Sill in the history of the Lawton Jewish community.